Preheat oven to 350 degrees Fahrenheit. In a large bowl, toss the tomatoes, white and light green parts of the scallions, 1/4 cup of olive oil, and salt and pepper until the tomatoes are well coated. Pour onto a rimmed baking sheet lined with parchment paper. Put the baking sheet in the oven and let the tomatoes wilt, about 45 minutes to 1 hour. They should be wilted but remain intact. Remove the tomatoes from the oven and cool to room temperature. In a large sauté pan over medium-low heat, add the remaining 2 tablespoons of olive oil. Add the crushed chiles and garlic and sauté for 1 minute. Add the red wine, sugar and vinegar and increase the heat to medium. Cook for 4 to 5 minutes or until the wine reduces by more than half and becomes syrupy. 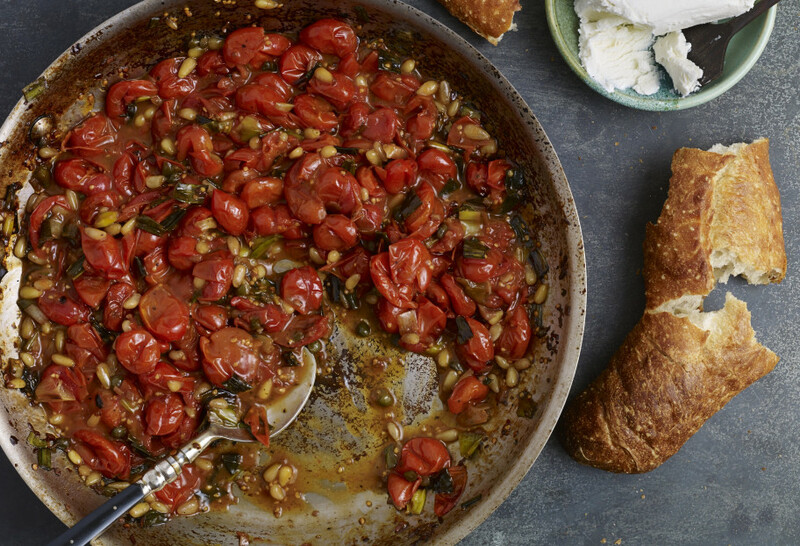 Reduce the heat to medium low, add the tomatoes, capers, and pine nuts. Stir all to combine and let simmer for 1 minute. Remove from the heat and place in a bowl for serving. Spread some goat cheese on the grilled baguette slices, top with some of the tomato jam, and garnish with cilantro and the remaining chopped green parts of the scallions. If desired, sprinkle with sea salt for just before serving. Could this recipe be put in canning jars for future use?even sweeter? Sure! Follow your typical canning process…but I wouldn’t include the pine nuts, scallions, or capers. For my own info when I make this later or for anyone who wants to make it the way it was made during the show: on the TV episode she used spring onions (instead of scallions), chopped chili de arbol (instead of red pepper flakes), and chopped pecans for crunch (no pine nuts or capers). Thank you Slicey. Sometimes once the show is filmed, I tweak the recipes to make them even better before they go up on my site. What was the name of the 2 wines and winery that you visited and drank in this episode? I’d like to see if I can find it and purchase it! They are from a vineyard in Guanajuato, Mexico, called Cuna de Tierra!